Some time ago, a read a great article on Harvard Business Review. It is about team management, team encouragement, initiative and delegation. Tasks are referred as screaming and hungry monkeys that need be fed and treated properly. The article describes the dilemma many leaders and managers are in. They have a big team but are still underwater with their tasks (=monkeys). And they collect constantly new ones. Because too often managers promise to do something that is actually their subordinate’s (team member) task. For example, the manager promises to read a memo and give a feedback. Or the manager promises to check a project presentation and take a decision. In every case, the manager takes the monkey from the back of the subordinate and puts it on his’ or hers. The manager becomes overloaded, the subordinate becomes immobilized. Both get frustrated. If your subordinates have tasks, encourage them to take (and keep) the initiative. If your subordinate needs a memo, let them write it and ask them to invite you to a meeting to review and agree on it. If your subordinate wants you to review a presentation, let him or her invite you to a meeting to present it to you. If your subordinate needs a decision, let him or her invite you to a meeting to present the facts and take a decision. In this way, your subordinates keep the initiative (and the monkey) but are no longer waiting for you. You can plan your time better. 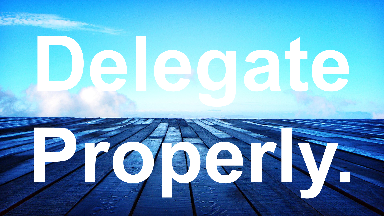 And you do what a good leader does when he or she delegates properly. You give someone a task and you direct, train and coach them to deliver successfully. You increase your discretionary time (see article). Now, you have time to lead your team. Now, you have time to manage the things leaders should manage. Now, you decrease frustration on all sides. Furthermore, you create trust within your team. And trust is fundamental to the success of a team. I looked at the file and it was huge. It was not possible for the manager to review it. Frustration was already on its way. Now both will meet and agree on the content. The manager has no additional monkey. The initiative remains on the subordinate. Nobody will get frustrated. In addition, it’s a chance for the subordinate to present his work and be visible. Do you also know this feeling from monkeys on your back? Let me know in the comments.